1)He disallowed plastic cups used for serving tea at railway stations and announced that they will be replaced by kulhads(earthen cups). The idea here was that this would generate rural employment. It also would reduce garbage as the kulhads are bio- degradable. 2) He made personal inspections in the railways. It is believed that he once inspected the Patna railway station by night. He sent out a clear message to his staff that he meant business. He undertook a surprise check at Rail Bhavan in New Delhi. He deducted the salaries of about 500 latecomer employees and sent them back. 3)Lalu carried out a surprise check on a goods train coming from Mumbai at Danapur station. He found that weights of consignments were under-assessed, leading to loss of revenue for Railways. He claimed that railway officials, transporters and consignees were part of a racket. A few top BJP leaders, associated with a company called Samrudha Overseas Pvt Ltd, were allegedly involved in the racket. 4) He planned to introduce joint patrolling by the Railway Protection Force (RPF) and the Government Railway Police (GRP). 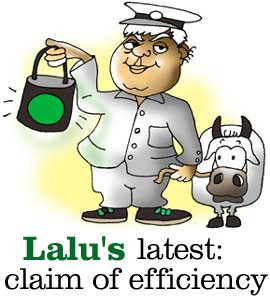 5) In his budget, Lalu didn't increase fares. He offered free second class travel for central governmental job-seeking travelers. He announced launch of 55 new trains. 6) He said that he would revoke the contract of A H Wheeler & Co, which runs newspaper stands on most Indian railway stations, because they were enjoying monopoly ever since English (British) left India and would invite open tender. 7) Lalu promised model railway stations, gauge conversion works and employment in Railways. Lalu's list of railway stations to be developed as "model stations" included 7 stations from Bihar and only 2 from the rest of India. 8) He plans for open ticketing and a new scheme on up gradation of lower class passengers to a higher class automatically. 9) Refused to hike fares. He shored up earnings by carrying more passengers and freight. Increased the load carried by a goods wagon from 81 tonnes to 90 tonnes. This gave an additional earning of Rs 7,200 crore. He upgraded tickets if seats were going vacant in the upper class. So, wait-listed passengers could be allotted seats. 10) He maintained passenger profile so that compartments could be taken off or added to trains according to seasonal demand. Lalu Prasad Yadav is now credited with engineering the financial turnaround of Indian Railways, which was on the verge of bankruptcy. Under him, the Railways booked an unprecedented surplus of 110 billion rupees (2.47 billion dollars).As part of his drive to modernize the railways Lalu Prasad Yadav has decided to send nearly 100 top officials abroad for training in latest techniques and sharpen their managerial skills in Management Schools of USA and France.